Have A Smartphone to Win A Smartphone! Hello again. So considering how I am SUPPOSED to be writing out cue cards for my presentation tomorrow and finishing up my typography assignment that is due next week, I have clearly failed. Because here I am. Again. Now, a bunch of my friends would have probably known how much I have been wanting to change my phone recently especially given that my phone has been failing me countless times. It needs a restart once every 3 hours; no kidding right there. Of course, given that I am already expecting to splurge some cash on a phone, I might as well invest in something I know could last me on a long run. So, I've set my eyes on the Samsung Galaxy S3. Don't get me wrong, it wasn't just for the fact that it was the "in" thing right now that I decided to jump on the S3 bandwagon, but I have just about settled for whatever functions they have to offer, especially on its display. Their contest details. Here's the link in case you can't see it. I was pretty astounded to see that just to win an S3, you would have to upload a picture on...Instagram. Really now? You are supposed to HAVE a smartphone just to WIN a smartphone? Oh and just in case you may not have a smartphone just like myself and you're wondering what Instagram is, it's a photo sharing application made available for free for all phones running on Android and iOS. No, unfortunately it isn't available on Symbian phones like my Nokia 5800 Xpress Music. I then proceeded to ask a quick question of my own, as you can see right here. I'm sorry about the blacked out pictures and white boxed cover ups. I wasn't too sure that strangers would have wanted their names plastered on my blog, so it really is just for privacy purposes. Now, if you'd take a look, I had asked them a question just about 21 hours ago; or at 6.42pm to be exact. 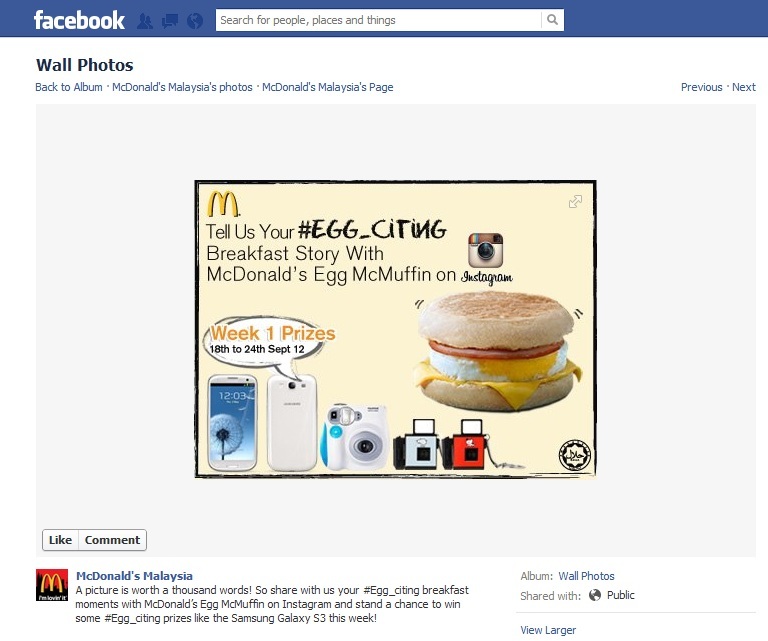 The reply by McDonald's Malaysia after was that we had to upload a picture on Instagram to be in the running to get ourselves a smartphone. There, there, maybe my comment felt a little cryptic for them to understand. That's fine, really. So I decided to type in another comment with the same meaning but using much more simple words. The verdict...was that I was completely ignored. Twice. If you notice, they had taken the time to reply a certain girl called "Joey" (whereby I did not COMPLETELY blank out her name but last names and pictures omitted) but my comment was just...ignored. It was like I didn't even say a word. It astounds me that as such a huge group in Malaysia and as such a renowned fast food chain, McDonald's Malaysia has acquired members of staffs who has seen fit to ignore their customers queries, whether positive or not. From what I see, they had picked to omit all negativity and respond only to positivity. 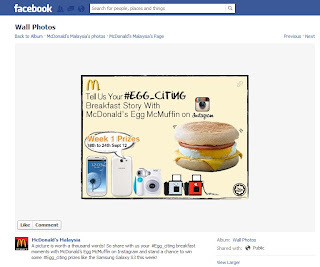 While I'm really not going to blame anyone, but I'd really just like to know if this was indeed how McDonald's Malaysia wished to "engage" with their customers. If you have finally turned to social media, the least you could do is TRY your best to answer them with poise. I wouldn't even have felt that bad if I had at least received a comment saying, "Hi, Elie we're so sorry that this contest is only open to Instagrammers. Maybe you could join us on our next contest in the near future?" or just something along this line. At LEAST say something to your customers, not leave them as they are! 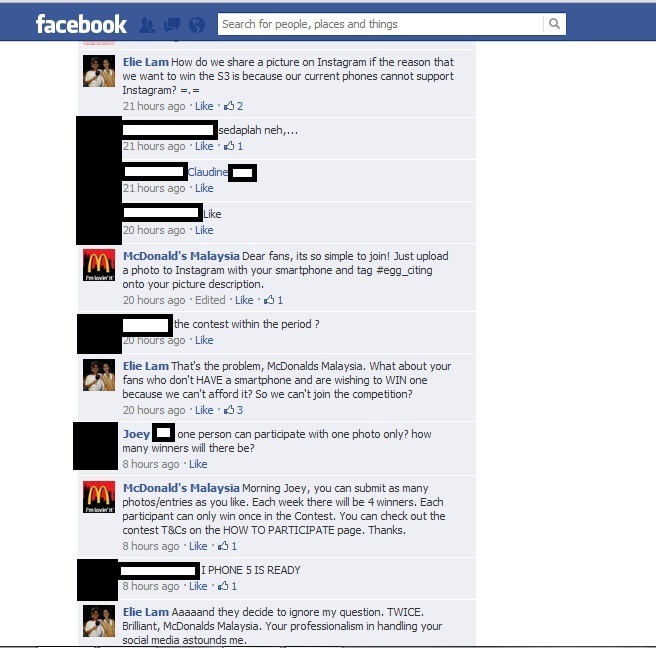 Silly, McDonald's Malaysia. How are we going to join a competition to win a smartphone if we don't have a smartphone simply because we can't afford one? I bet you never thought that the only reason why people want to win things is because they don't have the capability to get one, did you? Have you read my question yet? Or do you need it in a red font next? Indeed. 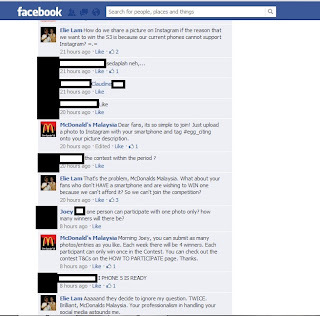 I find that McDonalds Malaysia does have a long way more to go on social media handling. It's horrible! Well, I hope you'd be joining other weeks...unless you have been terribly disheartened. Like myself, other contests maybe?